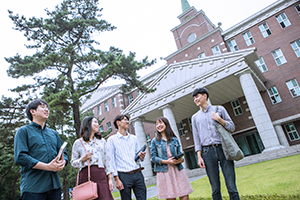 SU’s Department of Theology traces its 112-year history back to Euimyung School, which began as a pastoral training school in 1906 in Soonahn, South Korea. With a holistic education of mind, body, and spirit at its core, the department offers an integrated program of academia and spirituality to future ministers of the church who will preach the Kingdom of God to all corners of the world. The students build character and cultural sensibility—a necessity for a leader in the modern age—and learn the academics of how to succeed as a pastor and a missionary. The following is a list of core subjects: Language studies in English Theology, Greek, and Hebrew; Old Testament studies in Pentateuch, Prophets, and Historical Books; New Testament studies in Life Lessons of Jesus, Pauline Epistles, and Acts of the Apostles; Systematic Theology studies in Christian Ethics, and Soteriology; Church History studies in History of the Christian Church and History of the Seventh-day Adventist Church; and Theological Practicum in Pastoral Theology, Homiletics, Liturgics, and Evangelism.